[S295] Internet Posting, Willman Genforum. 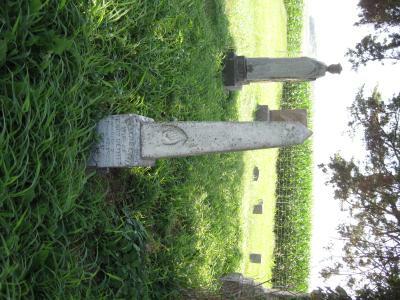 [S746] 1880 U.S. Census, Nebraska, Pawnee County, South Fork Precinct, ED 258, page 67A, line 9, dwelling 36, family 39, Nebraska, Pawnee County. [S2137] Germany Births and Baptisms, 1559-1898, online FamilySearch.org, Elisabetha Willmann. [S385] Book, History of Blackford Co, IN. [S1976] Works Progress Administration, Indiana Marriage Collection, 1800-1941. 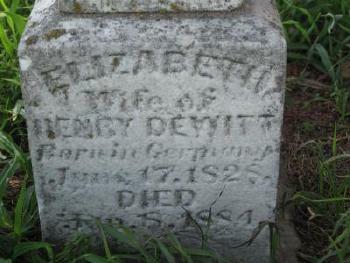 [S2085] Elizabeth DeWitt Cemetery Marker, Cincinnatti Cemetery, DuBois, Pawnee Co, NE.